Sahadeva was the fifth among the five Pandavas. His mother was the Madra princess Madri. It is believed that he was born by the practice of Niyoga by which a king obtains son to inherit his kingdom through his queen by the help of qualified sage like men. 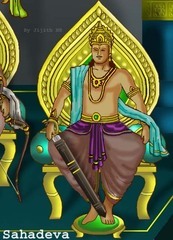 Kuru King Pandu thus obtained Sahadeva as son, through the practice of Niyoga. Sahadeva was born and brought up along with his elder brothers Yudhishthira, Bhima, Arjuna and Nakula in recluse of sages, in a forest surrounding the valley of Satasringa mountains, believed to be somewhere in Uttaranchal. Nakula later moved along with his brothers to live in the city of Hastinapura, the capital of Kuru kingdom. Sahadeva studied sword fight under the preceptor Drona.